Conwy Castle, constructed by King Edward I was one of the key fortresses in his 'iron ring' of castles built to suppress the Welsh. 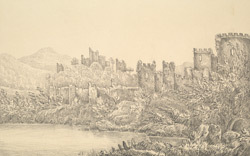 Conwy was actually much more than a castle and was in fact part of a complete town defensive system with over three quarters of a mile of protective walls, three gateways and 22 towers. Edward’s army of builders and skilled craftsmen worked on the castle between 1283 and 1293 and at one time their numbers reached 1,500. The total cost of the castle was £15,000 which would be equivalent to about £3 million today, more than 10 times his annual income.